Stylish modern 2 bedroom house located on quiet residential village just off Sukhumvit Road in North Pattaya. The house is sold fully furnished including fully equipped fitted western kitchen. Covered parking and small garden complement the property. 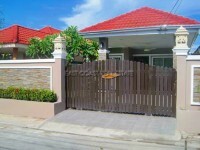 The location allows easy access to Central Pattaya and motorway to Bangkok.